Amerec is one of the largest sauna manufacturers in the world. The company has dealers in almost every US state while they also have international dealers in Canada, Mexico, and even Puerto Rico. They offer both residential and commercial based saunas, most of which are custom built for their customers. It should also be noted that Amerec focuses on indoor saunas and steam baths, although they are able to customize their offerings for outdoor buildings as well. 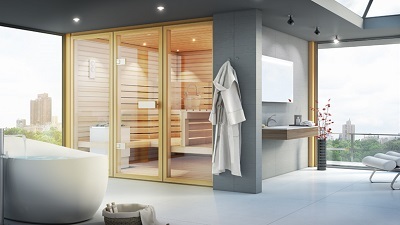 Amerec is a sauna manufacturer that is much more interested in taking advantage of modern technology and creating a luxurious experience than creating their saunas in an authentic manner. As we mentioned, their main focus is on building customized saunas that are created according to the specific dimensions of a particular space in a home or building. While this leads to a more convenient and efficient experience, it also takes away from the authenticity of the traditional Finnish sauna culture. Along with creating customizable saunas, another thing that separates the Amerec brand is the material that they use to create the sauna atmosphere. They offer options ranging from acrylic or cultured wall material to ceramic tile walls and ceilings to natural stone walls and ceilings. While these options do provide a more visually appealing indoor experience, this process once again takes away from the authenticity of the sauna experience. Customers looking for a sauna manufacturer that can provide custom made saunas that fit the dimensions of a specific room will be thoroughly satisfied with the high quality offerings that Amerec provides. Those looking for the traditional experience, however, should probably look elsewhere.